Pueblo Grande Ruin, a National Historic Landmark, is a large prehistoric Hohokam Indian village site that was continuously occupied between 100 and 1450 A.D. Heavily influenced by contacts with Mexico, the Hohokam built a Central American style ball court and a large masonry platform mound surrounded by caliche-brick dwellings between 1150 and 1450 A.D. The mound covers 3.3 acres and stands 20 feet high. 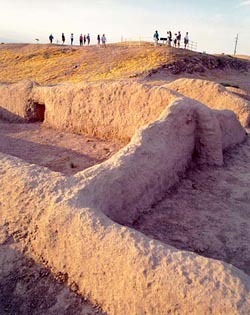 The Pueblo Grande Museum contains exhibits on the Hohokam people. Pueblo Grande Ruin is located at 4619 E. Washington St. in Phoenix, Arizona. A self-guided trail leads to the ruin. Open 9:00am to 4:45pm (Monday-Saturday); 1:00pm to 4:45pm (Sunday); closed holidays. There is a fee for admission, except on Sundays. Please call 602-495-0901, or visit the park's website for further information.